33% of Baltimore Residents lack access to a car. They rely on public transit, biking, walking, and ride sharing to move around the city. That number is as high as 80% in historically disenfranchised neighborhoods. But Baltimore spends a disproportionate amount of money on streets designed only to move cars. Our coalition introduced an equity-focused Complete Streets Ordinance in Baltimore City Council that will begin to address the disparity created by decades of structurally racist and car-oriented road design. Complete Streets are good for everyone. Complete streets prioritize the safety of all people using the street over the speed of moving cars. Complete Streets often have slower speed limits, wide and maintained sidewalks and crosswalks, pedestrian focused lighting, protected bike lanes, bus lanes and bus shelters, and beautification like trees and plantings. 33% of Baltimore households lack access to a car. That figure grows to as high as 80% in formerly red-lined communities of color. As a result of unreliable public transportation, people are forced to walk on, bike on, or wait for public transit on unsafe streets. Baltimore City’s streets are inhospitable for these uses, because they are designed for moving cars fast. 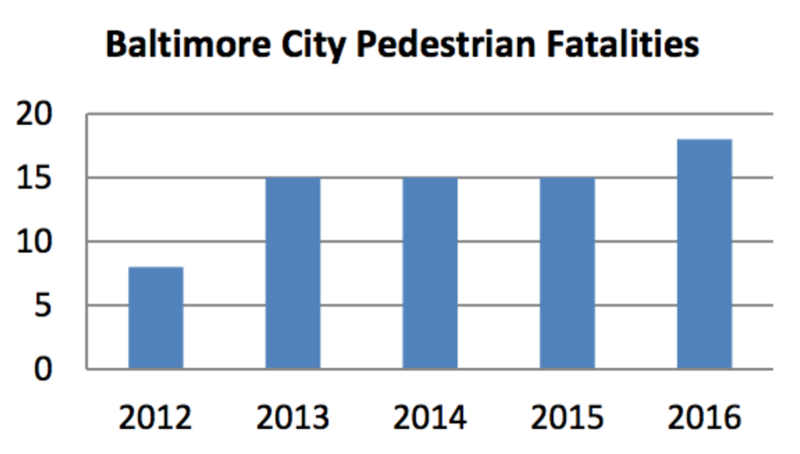 Year over year, Baltimore’s fatal, injury, and property damage crash rates are increasing. Our crash rate is 370% the statewide rate, and our fatality rate is 40% higher than New York City. Complete Streets improve public health. The focus on moving cars through our city also has health and environmental impacts. Baltimore’s asthma hospitalization rates are far higher than the state and national average. Asthma is particularly problematic because it is a key factor in school attendance. However Baltimore also has far higher than average obesity, diabetes, and rates of low to no exercise than Maryland, all things that enabling reliable public transit and safe walking and biking can help address. Baltimore’s childhood asthma rates are far higher than national average. Complete Streets spur economic growth. Bike and pedestrian projects are less expensive and have a higher return on investment than traditional road construction, and Baltimore families being less car reliant means they have more money to spend on everyday needs.